Sometimes people tell me they don't have the right dishes to set a pretty table. But you really can set a pretty table with what you have and to prove my point, I'm going to use Melmac. That's right...plastic melmac. 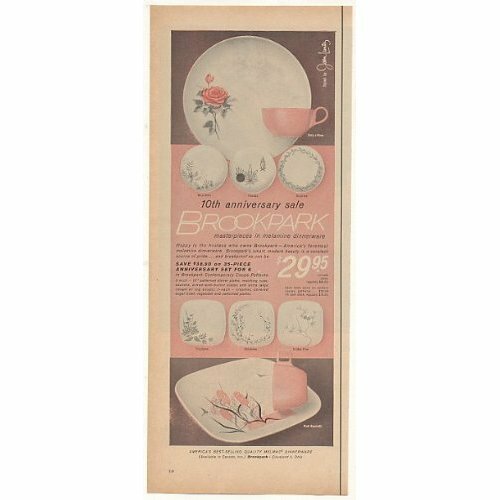 This pattern is from 1956 and has the coolest square shape...Brookpark "Pink Hyacinth." 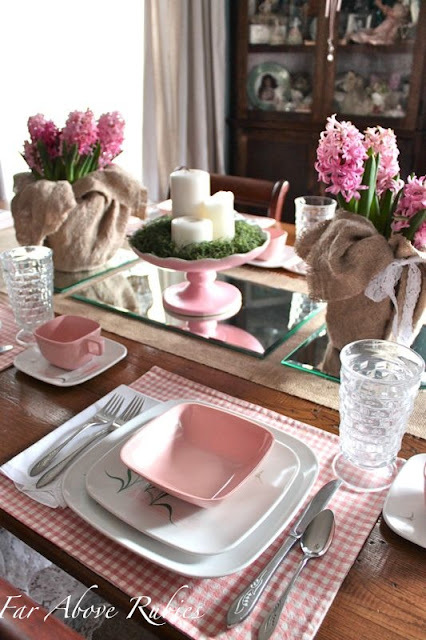 I remember my grandmother having square pink plates and I always loved them so much. I used a burlap runner I made with a mirrored runner my mother gave me on top. I happened to see pink hyacinths on sale for $2.50 a pot at Walmart so I snapped them up. I will plant the bulbs after they are finished blooming so they will be ready for next year. I used my mom's 1960s Oneida "White Lily" flatware, an Indiana/Colony Glass "Whitehall" iced tea, and vintage napkins from her collection. 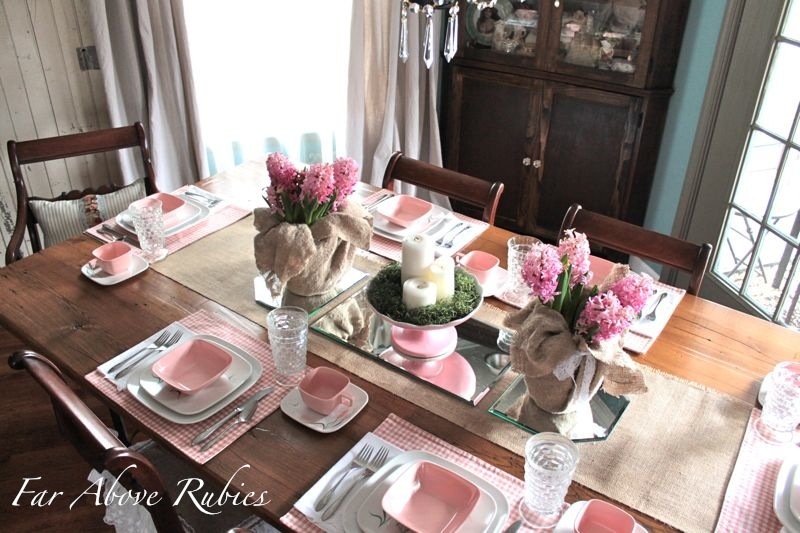 I made the placemats several years ago after searching for this odd shade of salmon/pink. They are reversible...here is the pretty floral on the other side. Oh...and the flatware tip...see the blade of the knife? Make sure it's facing inside to the edge of the plate. Everything is square in this pattern including the cups and bowls. 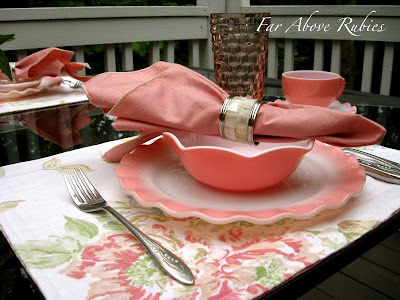 You can see an outdoor tablescape I did with this dinnerware HERE. I think you can set a pretty table with whatever you have. You can see the post about the slipcovers I made HERE. Thanks for stopping by:-) Please join me on facebook so you can share your ideas and inspiration. Everything looks so beautiful Anita! Your chandy is gorgeous. I love how everything pops against your blue walls. What a wonderful tablescape-so pretty and spring like. I think the little square coffee cups and bowls are my favorites. I love your placemats, the Whitehall iced tea glasses, and your Hyacinths (such fragrant flowers) wrapped in burlap. 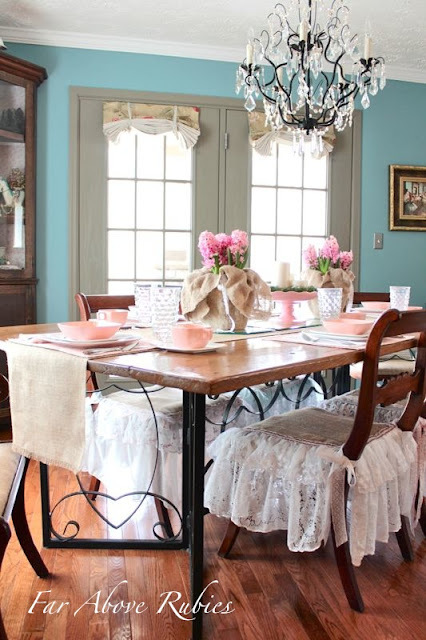 This is a beautiful, feminine spring table -- thanks for sharing! 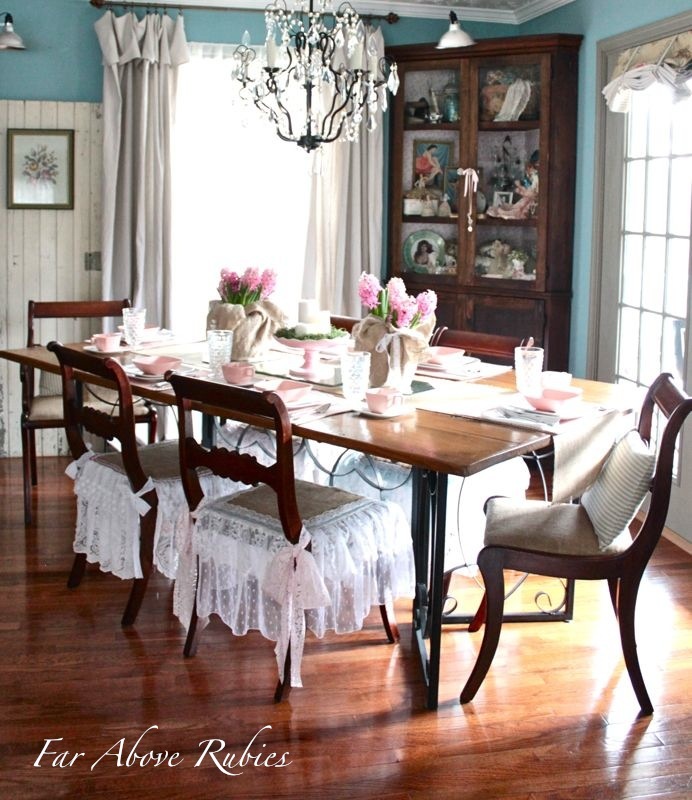 Your betcha you can set a pretty table with everything from china to paper and everything in between! You have proven it right here!!! I had no idea they had such pretty patterns in melmac that far back. Now I'm REALLY questioning why my Mom had that ugly everyday stuff that was so plain when we could have been eating from beautiful plates in my favorite color!!! :-) GREAT buy on the hyacinths! You dressed them up beautifully! Of course, you know I love your runner and those fabulous chair seat covers!!! So delicate and feminine!!! Your sewing talent and skill is such a blessing! What a delightful table! It's like time travel. 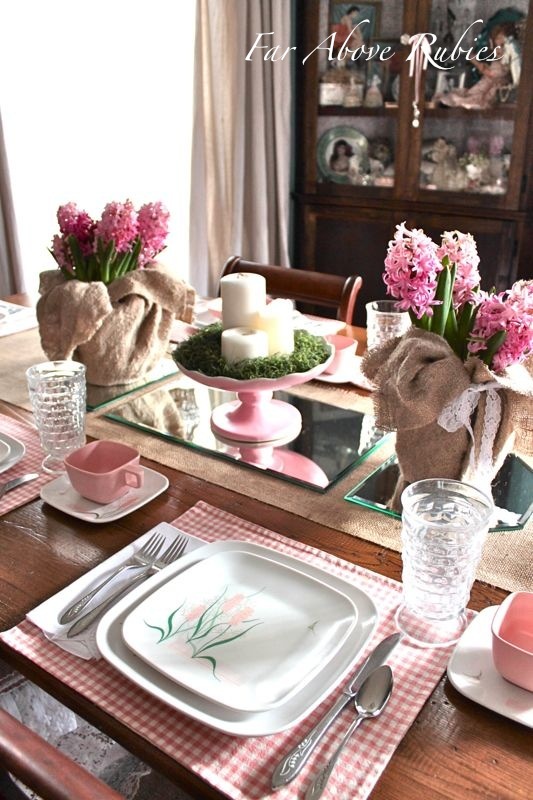 The pink hyacinths are the perfect touch. I love the way you have displayed them. All so cheery! Your whole room is fab! Gorgeous Anita, sorry don't know how I missed this post. I love all your history of table top and that you are using all your beautiful things. I agree,I always like the table set correctly and blades inward to dish. Your placements are so pretty and all your touches. Thank you for sharing your talents. What a pretty table! I guess you had no trouble making it lovely, because it's just stunning! Oh my goodness. 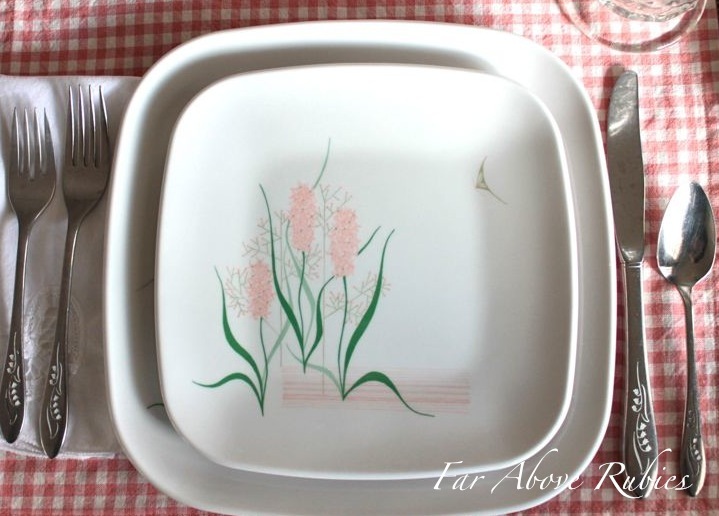 I had the round dishes with the roses on the plates in the old advert you posted. When my husband and I were first married, we used them all the time. Your table is lovely and brings back memories of wonderful dinners from days past.